stock retainers,keepers,and valves.High-rev single springs. *Include 3 angle valve job. 60,45 and 30 degrees. *Only shouldered silicone bronze guides are used. *One set of gaskets are perfectly matched to the ports. *Your motors compression figures are calculated for FREE!! 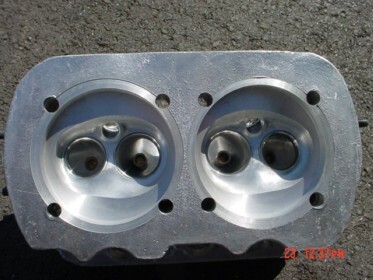 *Each set of heads is shimmed according to your cam & rocker specs. 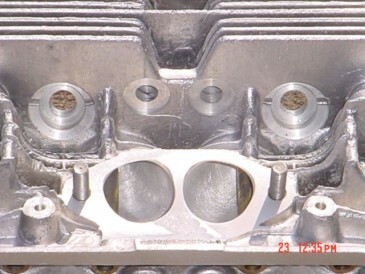 "Example" fk10=has .383 lift @ the cam X 1.45 rockers = .555 lift @ the valve. I would set at: .655 or .100 over total lift. This is needed to receive the maxim life and control out of your valve train. *I will match your manifolds up-to 3" inside the manifold for FREE!! or you may purchase a pair.